The Bradford Schools Linking Programme is led by The Linking Network. The Programme began in 2001 with two schools linking through a full school year, working in partnership with Bradford Council and the Bradford Museums Service. The number of schools involved has increased over time so that this year 103 classes are engaged in linking, connecting 76 primary classes and 27 secondary classes (19 of these Church of England and 2 Catholic); engaging 2,698 children across 45 primary schools and 12 secondary schools. This year we are exploring parent linking: more to follow! In the Bradford Primary Schools Linking Programme most pairs follow the traditional linking model and meeting at least three times over the course of the year. Our neutral venues include: Nell Bank, Cartwright Hall, Cliffe Castle, Kala Sangam and Bradford Cathedral. Prior to their first meeting, children take part in identity work in class through the exploration of the two key questions: ‘Who am I?’ and ‘Who are we?’ This exploration of identity and the exchange of work between link classes, lays a positive foundation ready for the children to meet for the first time. 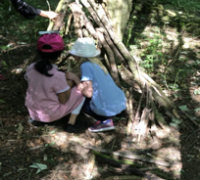 During the Spring and Summer terms, children explore community and equality through the last two key questions: ‘Where do we live? and ‘How do we all live together?’ Further exchange of work between link classes takes place as well as class visits. 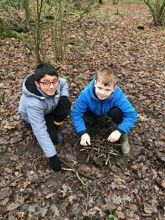 “This year I have found myself in a really fortunate position and have been delighted to have been able to support the Bradford Primary Linking Project as well as leading linking in my own school. Providing children with an opportunity to have meaningful interaction with others from a different background to themselves from a young age is vital, as I believe that it is these interactions that help to drive out any misconceptions that individuals may have about others. I feel great pride in being part of a programme that has our young children at the heart of it and aims to create an integrated and harmonious society”. Both schools are new to the linking programme and it has been a real pleasure to see the link develop between this pair as the year has progressed. Initially, there were some nerves (which were to be expected) on both sides, with children not really sure as to what they should expect and some feeling hesitant to meet others that they’d never met before. These nerves soon dissipated as the children got to know each other a little better through the exchange of curiosity questions and poems. The children even took part in Skype calls and exchanged videos, which served to enhance the linking experience. This preparation work was absolutely integral as it helped to build the sense of equal status, shared goals and lay the groundwork for easier meaningful interaction so that the children were ready to meet for the first time. By the time the children first met at Nell Bank, they were eager to put faces to names and even the shyest of pupils were eager to share what they had found out about their link partner when they got back to school. “I couldn’t sleep last night. That happens to me when I’m super excited, I can’t wait!” chattered one child. 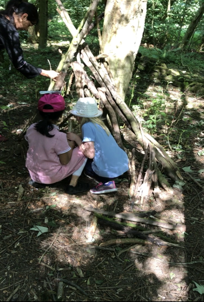 During the course of the day, the children took part in a range of activities where they had many opportunities to find out more about one another. 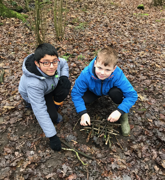 Activities included a scavenger hunt, a woods walk and playing on the adventure playground but the purpose throughout was meaningful interaction between the two groups of children. Since this first very successful visit, children have gone on to meet a further three times (at Cartwright Hall and then at one another’s schools), with relationships between link pairs really flourishing and a real buzz of excitement filling the classrooms any time linking is mentioned. As well as relationships developing between link pairs, many children have spoken about how linking has impacted directly on their level of confidence and their ability to talk to new people. For the children at Nessfield and Heaton St Barnabas linking has been a really welcomed addition to the Year 4 curriculum with many children citing linking as a particular highlight of the year. 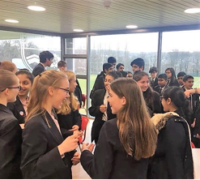 Secondary Schools Linking is a unique opportunity, crafting a safe space for students who would not normally get a chance to know each other- through joint activities on link days. The programme encourages pupils to feel confident and curious as they meet people of different cultures, faiths and beliefs. It also aims to instil recognition and respect for diversity and a meaningful encounter for both students and staff. Secondary linking can be a way to enhance aspects of SMSC, PSHCE, British Values and Religious Literacy provision within a school. It can be rooted in the curriculum to ensure pupils make progress through collaborative work. “She’s the Grange version of me!” It seemed it was just uncontained excitement as two pupils were bonding over The Vampire Diaries. The first event went so well that teachers were sending positive feedback to each other on the ride home. During this year, pupils reflected on identity and commonality (Who am I? Who are we?) and reflected on the importance of Human Rights (How do we all live together?). They took part in activities, which encouraged structured dialogue sessions and collaborative work on creative projects. One of the activities that they enjoyed involved the making of a 3D structure to represent the Human Right that they felt was most important to them. The last link meeting will be a celebration of the year together and will involve a ‘Great British Bake Off’ style challenge! 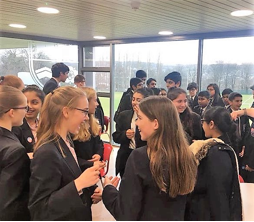 Year 10 pupils from Bradford Girls Grammar School and Bradford Academy came together to work on demanding GCSE style questions but there wasn’t a notebook in sight. Instead pupils were encouraged to reflect on deeper questions through activities promoting structured dialogue. By the end of the day; pupils felt a lot more confident about GCSE questions which require detailed evaluation and analysis. At the same time, it was a great opportunity to link pupils from two different schools together and an absolute pleasure to watch them work so well in collaboration. Students had to tackle questions like: Why would an Omnipotent Creator allow evil to occur? Do we really have Free Will? Is there life after death? We were also fortunate to have valuable contributions from Chaplains who work in Bradford’s hospitals. Joe Fielder and Maryam Riaz shared their experiences of counselling patients through very difficult times and how they are motivated by their faith to help others of all faith and no faith. The chaplains were also able to give their views on suffering and how through the darkest moments of human existence we can always find hope. “We managed to meet with our learners to debrief and everyone was extremely positive about the session. Many commented on feeling RE had been given a purpose, the session being pitched perfectly (not too hard or too easy), mixing with other students and having the chance to look at RE without feeling exam pressures. From a teaching point of view, I definitely feel inspired and loved linking with another school. It was a brilliant session”. One teacher who was working in one of the academies within BDAT was really interested in linking with other schools. 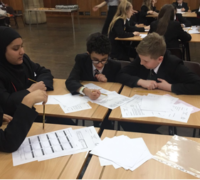 Especially as her previous experience of linking with other schools through a Maths Competition did not involve any real interaction between pupils of different schools and different backgrounds. Also, her school came last! 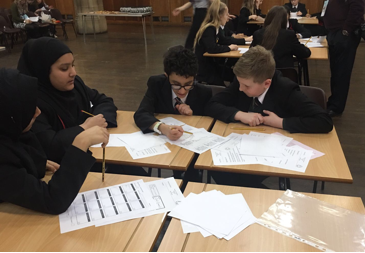 In the Maths Challenge that we trialled, students met prior to the challenge to work on identity and dialogue through team building activities at a neutral venue. This pre-session was all about building relationships and not maths, hence there was not a compass or calculator in sight! ‘I am a proud Bradfordian who has been living and working in Bradford for most of my life. I have a real passion for the city I call home and often find myself championing Bradford whenever I get a chance. However, despite this enthusiasm, I know that Bradford like many areas of the UK has its fair share of problems. I am worried about social mobility and like many, I too am concerned about a lack of integration and segregation in schools and the wider community. The Bradford I grew up was not always like this and I sincerely believe that I have benefited from such diversity.